Did you know you can know view your customer service stats on etsy? If you log into your account, click the Customer service Stats link at the left. It goes over all of the basics.... your score, and what Etsy recommends. Response time is the time it takes you to respond to a buyer's initial convo; only the convos you've responded to are measured. Shoppers may have questions about your items that need to be answered before they’re ready to buy — by responding quickly you can build trust and help inform their purchase decision. This is a huge pet peeve of mine, as a buyer. I like to be able to ask a question using the Convo option, but I don't want to wait a week for a response! If a buyer sees something they want from your shop, and they inquire about how many inches it is, or if you can alter the size, you as the seller should respond quickly. Not only because it's courteous, but because you want to make that sale! 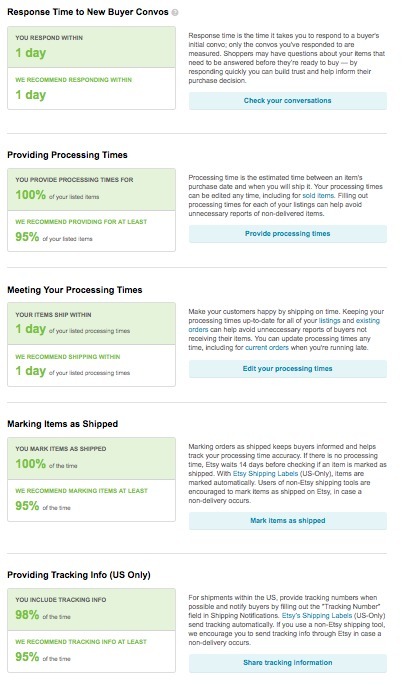 Processing time is the estimated time between an item's purchase date and when you will ship it. Your processing times can be edited any time, including for sold items. Filling out processing times for each of your listings can help avoid unnecessary reports of non-delivered items. Make your customers happy by shipping on time. Keeping your processing times up-to-date for all of your listings and existing orders can help avoid unneccessary reports of buyers not receiving their items. You can update processing times any time, including for current orders when you're running late. I always say, Say what you MEAN what you say. Marking orders as shipped keeps buyers informed and helps track your processing time accuracy. If there is no processing time, Etsy waits 14 days before checking if an item is marked as shipped. With Etsy Shipping Labels (US-Only), items are marked automatically. Users of non-Etsy shipping tools are encouraged to mark items as shipped on Etsy, in case a non-delivery occurs. Another very important tip! If they give you the option, USE IT! I always always always check to see if and when my orders ship. And if I don't see that status change, I write a convo to the seller. Although really, I shouldn't have to! It just takes a second to either print your labels from etsy and then the shipping status updates automatically, or, with a click of your mouse, you can change the status to shipped! For shipments within the US, provide tracking numbers when possible and notify buyers by filling out the "Tracking Number" field in Shipping Notifications. Etsy’s Shipping Labels (US-Only) send tracking automatically. If you use a non-Etsy shipping tool, we encourage you to send tracking info through Etsy in case a non-delivery occurs. When printing shipping labels directly from Paypal, you have to fill in this info manually to give your buyers their tracking info. But if you print your labels from Etsy, it does it automatically. Here's my stats for my Jewelry store! YAY! Thanks so much for this info, I had no idea it was available and after going to look I am meeting all the expectations! Can customers see this info? I don't believe so, but don't quote me. i have never seen a link on a person's shop. I would encourage folks to ship through Etsy. It is so easy and the rates are cheaper than at post office. The same goes for PayPal rates but I find PayPal more time consuming, but still better than post office. considering so much of this is AUTOMATIC if you do it thru etsy... yeah. and its faster printing than paypal i've found. paypal is more fussy. only thing about etsy is you have to weigh everything. i just stole my parent's scale and keep it by the computer. I haven't opened my Etsy shop yet but I keep hearing more reasons to do so. Etsy certainly offers a lot of benefits for the sellers; shipping, statistics, etc. for their fees. Just need to get up the courage to do so. Thanks Lorelei for sharing more info on things to know about Etsy.